A block or three over there is a little park. I've written about it before. It is M.E. DePalma Park and it was a converted "part" of a lot that was too small to do anything with. On this weekend the weather was so amazing that I decided I'd go there and take some pictures. It shows that in a small garden park, you can have some beautiful visitors if you just do the right plantings. Mother Nature would be there and show off her beauty if you would just allow her. M.E. DePalma has in her namesake park native species and the local critters have come back. I went out there in the sun and sat down on the bench and watched the goings on. I got a couple of confusing glances, and waved to them all. The WMPD looked over and made sure I was fine. Neighbors looked out and wondered what I was up to, and watched me watch the critters. 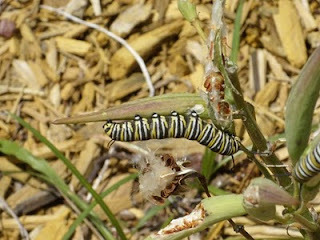 There were small clouds of Monarch Butterflies there because of the native flowers, and the Mexican Milkweed that had been planted as food for their young. What you see is a Monarch Caterpillar feeding on a seed pod. This particular plant had been stripped bare of leaves by no less than 10 caterpillars on the little clump there. No wonder why there are clouds of butterflies there in this little plot of a state named after flowers... Florida. I got to spend an hour there as a quiet observer waiting for the butterflies to land. They never did. They had their own agenda and were floating around like something out of a Disney Picture. If you get a chance, I'd say give it a go. If you like watching them as much as I do, you will have plenty to watch. Oh and those seed pods? I am hoping that they re-seed that little clump of Milkweed. The Monarchs need a place to land and my own Milkweed is a bit spare too.